Following a period spent on the English North Coast, Winslow Homer returned to the United States and settled on the equally cold and inhospitable Maine coast. The Distress Signal depicts a rescue at sea. In the foreground a group of sailors watch as fellow crew members prepare to board a lifeboat and reach safety. Their figures seem monumental as they confront a raging sea that is about to engulf a wrecked vessel. The canvas was first exhibited in 1891 and enjoyed such success that the New York publisher Charles Klackner had photogravure reproductions made and sold. In 1892 Homer made various changes to the work in a process that continued until 1896 when he dated the canvas. These modifications, which consisted of removing the boat’s bulwark rail and turning what was previously a sailing boat in distress into a half-submerged ship, functioned to emphasise the drama of the moment and to place more emphasis on the sea. In December 1890Winslow Homer wrote to his brother Charles, “I have got a fine picture called The Distress Signal a scene in mid ocean.” The painter was referring to the work in the Museo Thyssen- Bornemisza, which depicts a moment of great tension on the high sea. The whole composition is structured in such a way to exaggerate the dramatic force of the moment as much as possible. Both the very high horizon line and the diagonal perspective of the ship and lifeboat and the powerful waves that appear to be about to engulf the ship reveal the menacing face of nature. It is evident that the “ship under full sail” noted by the aforementioned critic in 1891 does not feature in the painting today, as Homer repainted his picture in 1892 and 1896 to heighten the tragic aspect of the scene. 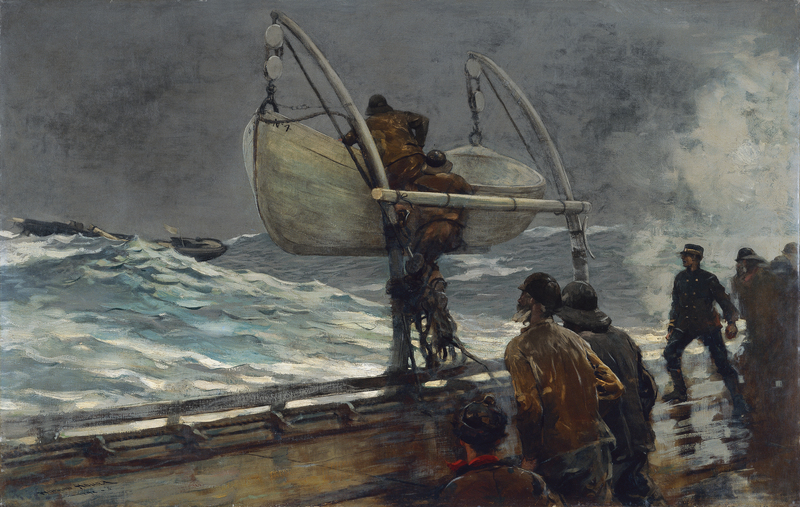 A comparison of the final work with a reproduction made by his New York gallery owner following the positive response to the painting at the 1891 exhibition shows that the painter not only converted the ship with unfurled sails in the distance into a small, soon to be shipwrecked boat flying the “signal of distress” but eliminated the ship’s rail and rigging. There is a pencil drawing depicting the lowering of the lifeboat from the ship’s deck, which later became the focus of the finished painting. Some time after its last modification, The Signal of Distress was acquired by the collector and artist George C. Briggs, an old friend of Homer’s from the Civil War period.